Stetson University College of Law’s Vis International Arbitration Moot team won two Honorable Mention Awards in Vienna. Stetson’s award-winning Vis team in Vienna (L-R): Leon Innerkofler, Jonathan Diamond, Sadiya Hashem, Kaelyn Steinkraus, Taylor Ryan and Brien Squires. Our student Vis team demonstrated in Vienna that they are prepared to advocate on the world stage. 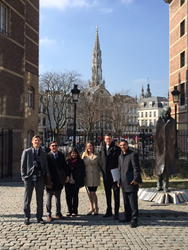 Stetson University College of Law’s Vis International Arbitration Moot team won multiple awards at the 23rd Annual Willem C. Vis International Commercial Arbitration Moot in Vienna, Austria, March 18-24. Stetson’s team of Sadiya Hashem, Leon Innerkofler, Taylor Ryan, Brien Squires, Kaelyn Steinkraus and student coach and team member Jonathan Diamond received two Honorable Mention Awards, one for the Respondent’s Memorandum and one for the Best Oralist. Ryan placed in the top 50 of nearly two thousand oralists. Stetson was among only six of 49 student teams from the U.S. who advanced to the top 32 teams in the worldwide competition. There were a total of 311 teams competing from 47 countries. Vaughan and Stetson Vis alumnus Alex Zesch J.D. ’13 traveled to coach the team in Vienna. Professor Joseph Morrissey also coached the team. Stetson also won an Honorable Mention Award for Best Oralist in last year’s competition.